Egyptian President-elect Muhammad Morsi addressed an enormous crowd in Tahrir Square on Friday, paying homage to the revolution that allowed him to come to power through the ballot box. Abdel Rahman was the leader of the al-Jama’a al-Islamiya (JI) or ‘Islamic Grouping,’ formed in the 1970s on college campuses at the instance of then president Anwar El Sadat, who wanted to use the Religious Right to combat Nasserist socialism. The JI joined with Ayman al-Zawahiri’s Egyptian Islamic Jihad (EIJ) in 1981 to assassinate Sadat. Abdel Rahman is accused by some of having given a fatwa authorizing the assassination, but the Egyptian state, when it tried him, appears to have found him not guilty on that count. He was jailed for a few years and then abruptly released by the government of Hosni Mubarak, upon which he emigrated to New Jersey. This part of the story is very suspicious, since why would the Reagan administration give a visa to someone who spent time in jail for helping assassinate the president of his country? Some Middle East specialists are convinced that Abdel Rahman was released early from prison and allowed to go to the US because he was a US intelligence asset. Whatever the reality of the matter, he started giving radical sermons at his mosque in New Jersey, and some in his circle tried to blow up the World Trade Center in 1993. One of those involved was the nephew of Khalid Shaikh Muhammad, the al-Qaeda strategist, and Abdel Rahman appears to have been an early joiner of al-Qaeda. He is now in a maximum security prison. In Egypt, the JI rethought its radicalism and violent tactics, and its leaders in Tura prison issued ‘repentance pamphlets’ beginning in the late 1990s in which they argued that violent tactics are ‘inappropriate to today’s conditions.’ Omar Abdel Rahman denounced his old organization for giving up violence and turning to civil society organization. (The JI now has its own party, and some of its former members are probably in the Salafi Nur Party or the Brotherhood’s Freedom and Justice Party). So Morsi is calling for the release of the worst of the worst. Why? 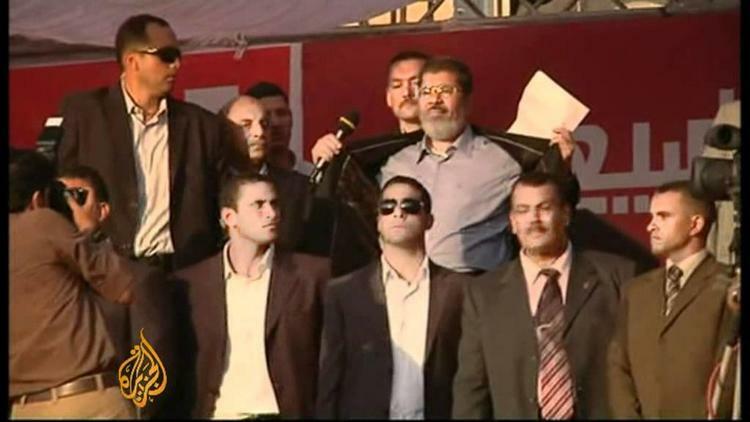 My own theory is that Morsi has been moving toward the center, at least symbolically, since his election. He is talking about appointing a Coptic Christian and a woman vice president. In moving to the center, he risks losing the support of the fundamentalist hardliners. (Many Egyptians are convinced that he will do a backroom deal with the military council). Calling for Abdel Rahman’s release is a cheap way to signal to the other fundamentalists that he is still one of them. The US is not in fact going to release the blind Sheikh, so he faces no real-world problem of dealing with such a release. It is just hot air. Likewise, the call serves to put Washington on notice that he is no Hosni Mubarak, and the days of the US and Israel hearing sweet nothings from the president of Egypt are over. He went on to underline that Egypt is an independent country and will have an independent foreign policy. The conviction on Friday of high officials who saved Israel a billion dollars a year by selling it natural gas at below market prices underlined for Egyptians just how corrupt the old order was, and Morsi wants to convince them that he is still a Cairo outsider. On Twitter, Marc Lynch suggested that Morsi worries about losing popularity to the real radicals, the group that follows Sayyid Qutb and believes in calling other Muslims ‘infidels’ if they aren’t hardline fundamentalist enough. This call was a way for him to steal one of their pet talking points and leave them with nothing on which to attack him. What Morsi’s call for Abdel Rahman’s release does not signify is any approval of violent radicalism. Morsi put him in the same category of unfairly arrested protesters and political prisoners in Egypt. Likely Morsi believes that Abdel Rahman was railroaded by US courts and is not guilty of conspiring to blow up the World Trade Center. So he considers the blind sheikh a political prisoner. In his speech, Morsi also underlined the principle of popular sovereignty, saying over and over again that power derives from the people and various offices can only be filled by their will. He had his reasons for this emphasis, but please note that an earlier generation of Muslim fundamentalists would never have acknowledged the idea that the people are sovereign. Ayatollah Ruhollah Khomeini in 1979 during the Iranian Revolution denied the truth of this idea. If, he said, the Imam or divinely appointed leader said one thing, and (then) 37 million Iranians said another, the Imam would always be right. Some Iranians wanted to call the revolutionary state the “Democratic Islamic Republic of Iran,” and Khomeini rejected this term. Theocratic movements always have the problem that they are inflexible and cannot compromise because they think their principles are divine. But these theocratic movements are the impatient ones. Morsi is a fundamentalist, and make no mistake, he wants to impose a rigid medieval conception of Islamic law on Egypt. But he isn’t in a hurry, and that makes all the difference. He is willing to wait until the people come around and vote for such measures. Such a stance requires a trust in that ultimately the people will do the right thing. If it is true that Morsi and his colleagues accept the principle of popular sovereignty, it is the greatest reformation of Islam in over a century. As Marc Lynch argues, it is impossible to know at the moment how sincere this rhetoric is. But it is possible to monitor the Brotherhood and its development to see whether it really is moving in a democratic direction. It would be ironic if Morsi is forced into invoking popular sovereignty in order to fight military rule, such that democracy becomes the only way for the Brotherhood to escape the SCAF junta.